Hi friends! So glad to see you here. 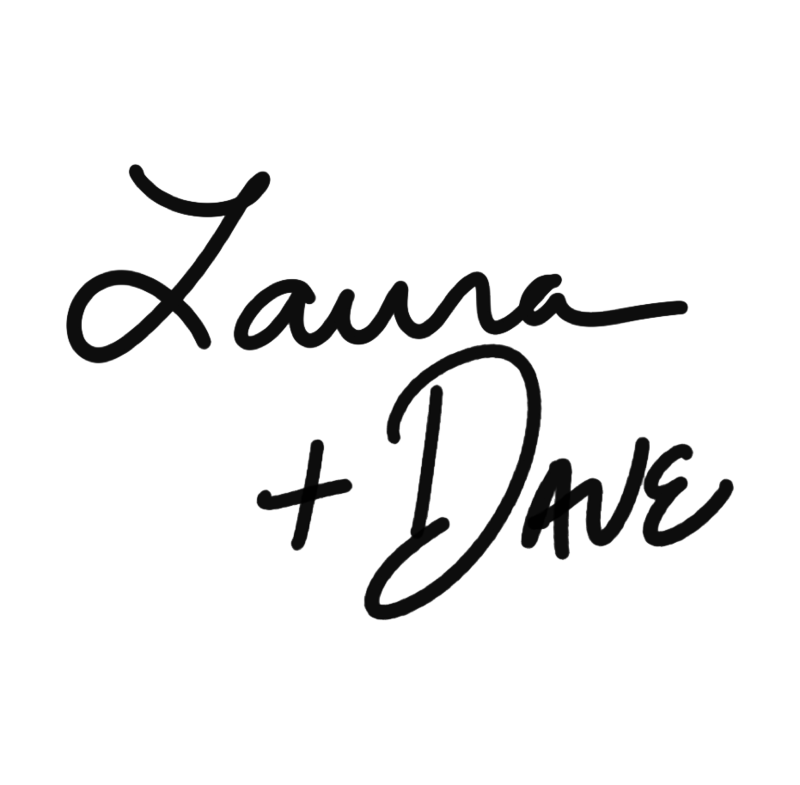 We are Laura Drapac and Dave Koen, owners of THREEFOLD Gifts and Triple Threat Press. THREEFOLD Gifts is our latest retail foray–a brick-and-mortar shop opening Summer of 2018 at 13339 Madison Ave. in the east end of Lakewood, Ohio. At THREEFOLD, we're proud to sell well-made handmade items for your life and home. Our mission is to help independent makers grow their businesses & earn a living from their talents and trades. THREEFOLD's vendors are all professional small businesses owners, but not only that, they're members of a community of makers creating with a conscience. Our makers know that THREEFOLD customers deserve to own products that look good and make them feel good about buying them. With the opening of THREEFOLD Gifts, we figured that now would be a great time to reflect on how we got to this point... and hopefully speak a bit about what the future holds. The THREEFOLD story begins with the birth of Triple Threat Press. We had moved to Texas in August of 2009 so that Laura could attend grad school at the University of North Texas. After graduating in May of 2012, Laura–who was working as an adjunct professor at the time–lost access to the school's printshop and needed a place to make her own artwork. We spent that summer finding, purchasing, and restoring a Kelsey Excelsior letterpress that had been stored for years in a barn. The press was so rusty that it wouldn't even close, and had to be completely disassembled and cleaned before we could even think about pulling a print off of it. The press was ready to go by September and since the holidays were coming up we decided that we should make some holiday cards as a way to pay for the press restoration and needed supplies. We applied for and were accepted to the Etsy Denton Handmade Harvest based on greeting cards that we printed out on our inkjet printer while we waited for ink and rollers for our letterpress to arrive. At our first show we had nine products on display: six holiday cards and three hand bound notebooks. We barely made enough to pay for our booth fee, but honestly... that really didn't matter. People came out to support us, and we were ecstatic. Triple Threat Press was born. Shortly after our first event, Etsy Denton changed their name to the DIME (Denton Independent Maker Exchange) and opened their own brick and mortar store just a few blocks south of the Denton Square. Run by co-founders Shelley Christner and Rachel Aughtry, The DIME Store was a year round extension of their events where buyers could shop with several local, handmade vendors all in one place. For their grand opening weekend invited us to create a chalk mural of our "Welcome to Denton" postcard on their wall. Laura was their first–and, for a time, only–employee, where she learned all of the ins and outs of organizing inventory, paying-out vendor earnings, merchandising, vendor relations, and event planning. During this same time, Dave was working two blocks away at Mad World Records, a record store owned by Mark & Maria Burke. Dave had spent years working in retail and at his family's transmission shop but it wasn't until Mad World that he got his first taste of small business retail. An avid record collector, Mad World was was also the perfect combination of his inventory management, merchandising, and customer service skills. He soon became a key holder and began honing his quick thinking abilities through computer malfunctions and the day-to-day difficulties of running a small business. Through these two businesses we were able to form so many great relationships and do work for–and with–some of our best friends. Through the DIME Store we collaborated with Carrie Crumbley at Resoycled Candle Co to create a line of candles based on the smells of the printshop, and had our Denton Courthouse coaster design put on a t-shirt by Sarah and James at Dozy Dotes Totes. When Atomic Candy opened just down the street from Mad World, Dave was an instant fan and quickly befriended the owner, Tim Loyd, as they bonded over their shared love of rusty junk and old cars. Tim was also always game for whatever crazy designs we came up with and had us create several ads for festival programs and newspapers. We were also tapped by Mark Burke to design and print a poster for Mad World Records' two-day, five-year anniversary show. We printed the two-color design on the backs of old album covers that he donated. Triple Threat Press offered us several more amazing opportunities, including letterpress printing business cards for renowned sign painter Sean Starr, creating a custom letterpress-printed album cover for Fishboy, and representing the City of Denton by holding a day-long live printing demo at SXSW. By May of 2016, our time in Denton had run its course. We were looking to move Triple Threat Press out of our house, or at the very least into a house that we owned. It just didn't seem like either of those options would be a possibility in Texas. So, we packed up the presses and moved home to Cleveland, Ohio. When asked what we would be doing in Cleveland, our typical response was, "figuring it out!" Almost immediately Laura stepped into the event coordinator position at the Cleveland Flea, a job that was an ideal continuation of her work at DIME. Dave continued the work of Triple Threat Press and moved it into a studio in Slavic Village, which allowed for the acquisition of a larger floor model press from Keith and Jamie at the Cranky Pressman. Laura has since left The Cleveland Flea to pursue our goal of growing Triple Threat Press into a full-time job for us both. Just this year we've managed several large projects for ourselves already, including designing the new logo for Slavic Village's community dinner event The Village Feast, working with Habitat for Humanity Greater Cleveland's ReStore to print and sell greeting cards featuring donated cuts that will raise funds for the non profit's area projects, and designing a logotype for our friends at the West Side Market Tenants Association that honors the historical building which houses their businesses. So, here we are in the Spring of 2018... and we think that now is the perfect time to combine our loves of and experience in running small, local, handmade businesses. THREEFOLD will open June of 2018, and will proudly host the products of over 40 amazing independent makers and designers, not to mention serve as the home base for Triple Threat Press' operations. We've decided to open our brick-and-mortar shop in Lakewood, Ohio–a place that prides itself on it's walkability and unrelenting support for small business. It also happens to be the city that we call home. Our hope is that we can bring together the best handmade businesses, give them a place to sell year-round, and allow them to earn a living on their talents and trades. We also want to foster relationships between makers in Cleveland and beyond, encourage collaboration on new products, share information about upcoming local and regional shows, and serve as a hub for any maker looking for a hand. There will undoubtedly be challenges ahead, but nothing worth doing is ever easy. We are excited and ready to embark on this journey. We're so glad that you're coming with us! Excited to hear more? Follow us for the latest updates!